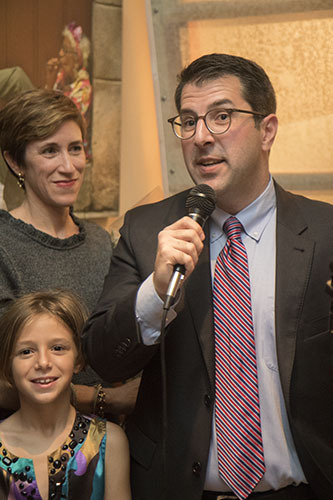 Joe Giarrusso, III has clenched the New Orleans City Council District A seat with 65 percent of the vote. Giarrusso garnered more than 11,000 votes for the seat, beating out five opponents and avoiding a runoff election next month. Aylin Acikalin Maklansky won twenty percent of the vote, with Toyia Washington-Kendrick in third place. About 100 supporters, friends and family members gathered inside Cafe Minh in Mid-City late Saturday to watch the election results unfold. 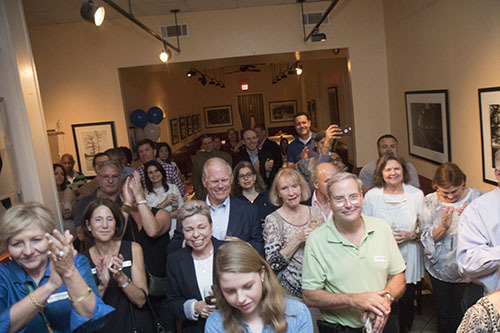 As Giarrusso made the rounds shaking hands and greeting friends, the crowd exploded in cheers when WWL-TV called the District A seat for the attorney. His wife and two daughters quickly made their way to his side, as did outgoing District A Councilmember Susan Guidry. Guidry threw her support behind Giarrusso in late July. “I’ve watched his civic career, and I’ve seen him walk across the aisles to get things done,” Guidry said. For the past seven years, Guidry has worked to transform large empty swaths of Mid-City into viable businesses, such as Costco and the Mid-City Market on Carrollton. She said Giarrusso was the best candidate to continue that economic development, though for smaller businesses. Giarrusso said his top priorities includes economic development, which plays a role in overall crime reduction as well. He also vowed to focus on short term rental policies and continue to investigate the mismanagement of the Sewerage and Water Board. Giarrusso voted to remove City Council members from S&WB oversight as a board member of the Bureau of Governmental Research. The new councilmember won’t take office until May, giving him a substantial amount of time to prepare for the office. Giarrusso said he’ll use those transition months to visit neighborhood and civic organizations to get a feel for each area’s wants and needs. Five other opponents vied for the District A seat, including Drew Ward, Daniel Ring and Tillman Hardy. District A voter turnout topped out at 32.5 percent, according to the Louisiana Secretary of State’s unofficial election results. As for District B – which also covers parts of Mid-City – candidates Seth Bloom and Jay Banks will face off in a November runoff.